distribution Scattered over most of the Coastal Plain and the eastern half of the Piedmont. Recorded from slightly fewer than half of the counties within this range. abundance Rare to very uncommon, but certainly overlooked in its shady habitat. The peak count of just 12 individuals is indicative of its relative scarcity, as is its spotty range in the state. flight The flight patterns are oddly "bimodal", almost as if a migratory species or one that aestivates in the warmer months. Most of the combined Coastal Plain and Piedmont records fall between late March and mid-June, and again between mid-October and late December. There are only four records within this four month gap! habitat Streams, swamp edges, and other pools under heavy shade, essentially always under a forest canopy. behavior Quite shy, this species comes by its common name honestly. Individuals perch low, often hidden in vegetation. 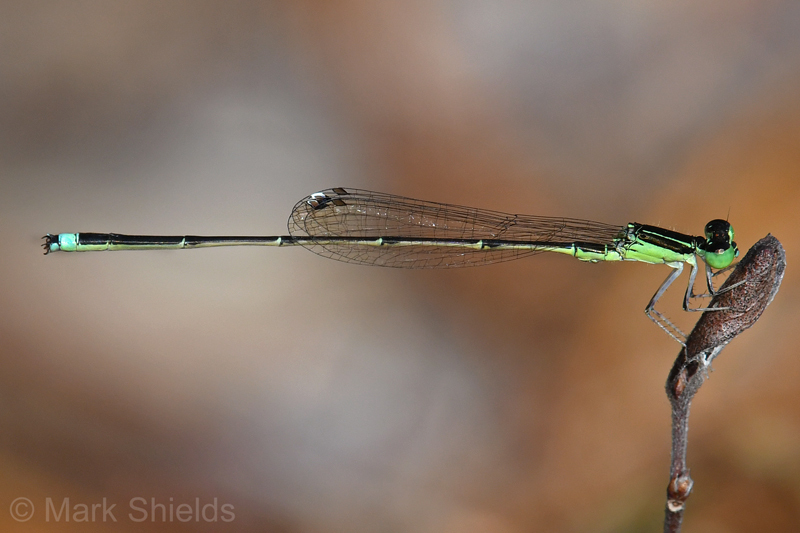 comments This species' odd habitat selection -- shaded waters in forests -- makes it somewhat more difficult to survey for, and observe/photograph -- than other damselflies. This behavior is at least partly responsible for its spotty range in the state. Mark Shields has provided several recent (2016-17) photos from the southeastern corner of the state, and several others added photos from the northern Coastal Plain in 2018. Comment: Bertie, 2018-04-29, Charles Kuralt Trail, Roanoke River NWR along US 17 north of Williamston. - 10 males, 2 females.